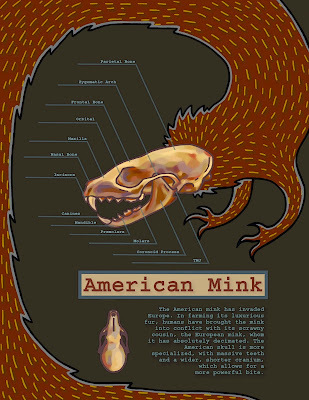 DESCRIPTION: The American Mink was introduced to Europe through large-scale fur farms, and has since escaped captivity to colonize the land, decimating it's smaller cousin, the European Mink. What allowed the American Mink to dominate its cousin so brutally is its specialized skull and massive teeth. This illustration aims to show both the anatomy of the skull and the invasive, predatory nature of the species.